Here's Miss Chipps, a single-tier strip from Family Comics. This one was signed Memling and Beckerman. I'm assuming this is writer Carl Memling and cartoonist Howard Beckerman, but I'm certainly open to being told otherwise. Carl Memling was a prolific children's book author. He did a lot of tie-in storybooks to TV series and comic strips. My knowledge of Memling's work is slight, but the adult-oriented nature of this strip would be a significant departure from his typical output. Howard Beckerman is best known for his work in animation. He is best known for the celebrated Schoolhouse Rock series of education shorts for Saturday morning TV. The style here doesn't match what he was doing in the 70s, but artists can certainly grow and change in the span of over a decade. EDIT: No, no, no, no. Howard Beckerman himself sends me an email saying that he had nothing to do with Schoolhouse Rock. This is yet another case of one person making a mistake and it spreading all over the net like a cancer. My apologies for the misattribution. And if you'd like to know what Howard is really up to, as opposed to any fantasies I might concoct for him, visit his website. And an original dated 6-15 for number 7 is on sale at e-bay now. None were offered by Lowery. 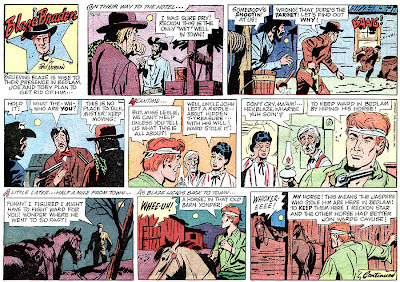 Here's the first of the adventure strips from the Family Comics section, a western called Blaze Braden. This one was credited to Paul Morgan. I'm assuming that was a pseudonym. Interestingly enough, The Tab Hunter Show on TV featured Tab as a cartoonist named Paul Morgan in 1960. The art on this strip seems to me a bit on the hacky side, looks like the work of a comic book artist. Perhaps one of you readers more into comic books can shed some light on an artist ID. Blaze Braden is another strip that was advertised in E&P in 1960, so I guess my earlier estimate that most all the strips just gave up when the section folded was premature. Like Happy Days, it was advertised as being syndicated by Crown Features Syndicate. I've never found anything from Crown running in any newspaper. Just wondering. Where did you find copies of "Family Comics?" No copies of this one were sold by Howard Lowery. 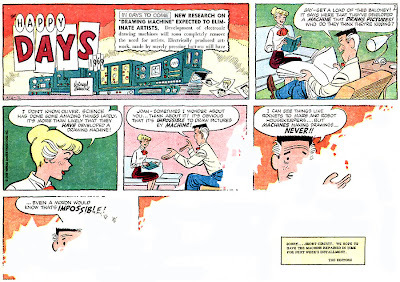 The art to me looks in the mold of Johnson/Cushing or Treasure Comics type advertising art, with an artist who is probably trained in cartooning rather than realistic art, probably with a seperate inker. The girl in the second 'sunday' could be by Maurer again. I got them on eBay, 8 of the first 10 issues in one lot. Believe it or not, I got them for the opening bid of $10. If that seller had any idea of my maximum bid he'd have a coronary! No I didn't know that Sponsored Comics also did comic books. So did the comic books all come out earlier (pre-1959) or did they continue on past the brief life of Family Comics? We could perhaps clear up the question of who ran Sponsored Comics based on the address. On Family Comics it was 9424 Dayton Way, Beverly Hills. Is there any way to cross-check this with Maurer's address I wonder? Easier yet, of course, if any of these creators is still alive perhaps they remember. Unfortunately there are none that I know of for sure. Could the credit to John Ushler be wrong? This looks more like "Al McKimson", i.e. the teamwork of Pete Alvarado, Charles "Chuck" McKimson and Thomas McKimson. 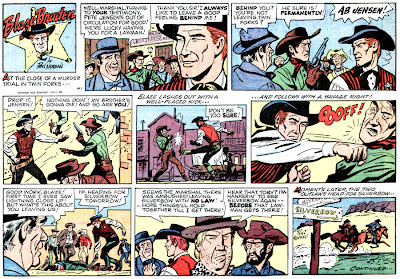 The style is very close to their work in the "Roy Rogers" comic strip. Thanks to my friend José Antunes for drawing my attention to this. For the introductory post on Sponsored Comics click here. Happy Days 1969 was bylined to Norman Maurer. Maurer was, I believe, the man behind Sponsored Comics. His contribution to the section was a delightful fantasy of the future, a world right out of the Jetsons that Maurer apparently thought might just happen within the next decade. 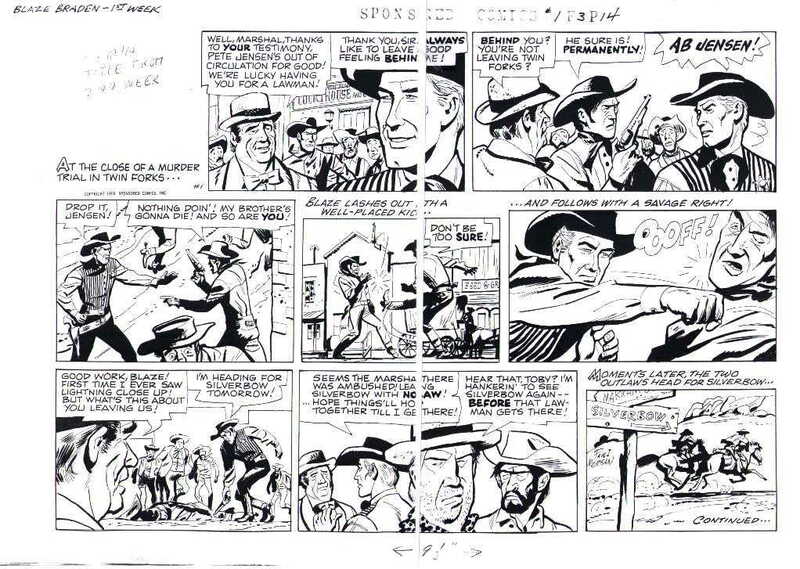 The art on this strip is absolutely fantastic, and though I remain skeptical of art-spotting, my own included, I think this strip was probably ghosted by the great Al Wiseman. 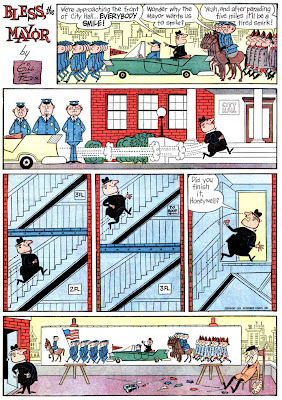 Wiseman was the master cartoonist who turned the Dennis The Menace comic books from what could have been just another forgettable comic strip spin-off into a work of enduring value. 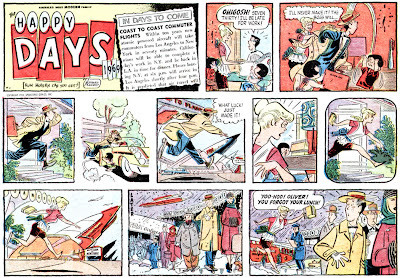 Unlike most of the Sponsored comics which came and went with the section, Maurer in 1960 tried to syndicate this feature as a Sunday strip and daily panel. It was listed in E&P that year but I've never seen it appearing in any newspaper. These samples are looking great. Wish this type of weekly magazine, which has nothing but Sunday style comic strips, were strill around. I'd subscribe to that. You know, you'd think with King Features being a part of Hearst, and with Hearst having a thriving magazine business for many years, that there would have been a point in its history where they would have ventured into magazines based on its own syndicated material. Guess they were thinking that would have been competiton for those to which they could have licensed their products? Well, why not now, with comic strips receiving such shabby treatment by newspapers? Why not a "MonthlyINK" magazine, featuring recent and classic Sunday comic strip installments in print? Use some of that existing Hearst magazine muscle to get prominent display on newstands. You might say that the syndicates are doing that now with their subscription websites. And some newspapers are getting pretty peeved about it, which is reasonable, seems to me. Newspapers pay a small fortune for their comic strips, and readers can see the syndicate's entire output for what, $10-20 per year? If newspaper editors could admit to themselves that so people buy newspapers mostly for the comics there would be a major revolt against the practice. Luckily for us, they refuse to admit it, even to themselves. Obviously, originals for this strip were sold by Howard Lowery. I have about four of the scans in my files. A charming series, alhough maybe a bit too confusing for a normal audience. And how would you do a daily for it? I wonder if Maurer did daily samples for the syndicate. Interesting to read tyou see evidence of a ghost here. The style is very similar to Maurer's work on the Mad imitation Whack - except maybe for the slicker inking. Well, if this is Maurer's work he must have had the same art teachers as Al Wiseman. I haven't seen any of Maurer's work in years (and then only in those 3-D comics) but I didn't remember it being this polished -- pleasing but not up to this standard. Do you happen to know of any sources where I could see a sample of his work on the web? The sites I just checked were all too preoccupied with his Three Stooges connection to bother much about his cartooning. Yes, syndicates are selling their materials through websites. In case you didn't pick up on it, my "MonthlyINK" title was a play on King's "DailyINK" site. I was really addressing Hearst's power in the magazine market and wondering why they haven't long ago done something for the print world to harness the power of their own features rather than licensing them to Western and others. My response to newspaper editors who don't like my subsribing to DailyINK -- give me the comics I want to read, offer some classics (or at least some as worthy as the classic adventure strips), and provide them at a size I don't need a magnifying glass to read -- then I'll consider the arguement. I can see why you'd say Wiseman, but I dont think so - (but see below), there are some guys who look like Wiseman - some like Lynn Karp worked for for Wiseman too. Comic books for the 1970s that Maurer did include the "Little Stooges" for gold key (the inking does look like this work) - and stuff for Joe Kubert's war books. now for "the below". there is a Dennis the Menace Giant cover by Al Wiseman drew, that features lots and lots of names in the background - including that of Norman Maurer!! I can't give you any Maurer sources. I could probably round up a couple of samples. Maybe the advertising thing is even in my upstairs computer. I'll have a look tomorrow. The comic to be looking for is Meet Miss Pepper. That and the earlier Stooges comics are the closest to this style. You can still get the 3d reprint series from Ray Zone relatively cheap. The other connections to look out for are Bill Overgard, who worked on Whack and did comic strip parodies for some of the later Stooges issues (in the St. John run). I'll be writing about those in an article on Mad imitations in Alter Ego - which should be finished in half a year and published a year after that, but still. Carl Hubbard was on Whack too. His style was similar to Maurer's. After St. John folded Maurer went to Timely and did a couple of westerns for them. For that his style became less angular. When he later turned up at DC doing a couple of stories, his style was less idiosyncratic as well. These couple of 'sundays' are an anomaly, as they seem to hark back to his St. John days stylewise. Here's our first Sponsored Comics strip. To catch up on our discussion of Sponsored Comics, see this post. 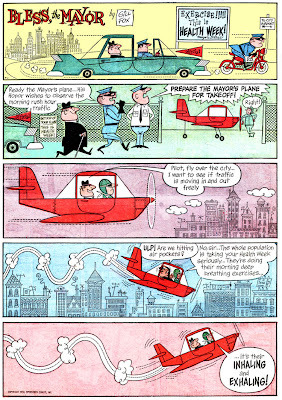 Bless, The Mayor, for reasons unknown, was the only Sponsored Comics strip that merited a full tabloid page. It sported hip 1950s-era art by Gill Fox. Fox was an excellent cartoonist who was also at this time producing a minor panel feature called Wilbert for General Features. It was doomed to be cancelled just a few months later in 1959. Gill was also producing occasional filler comic strips for the New York Daily News during this time, and as I understand it, also working for advertising firm Johnstone & Cushing. A busy guy, but not too busy to produce these really eye-catching pages for Sponsored. Okay, that does it. 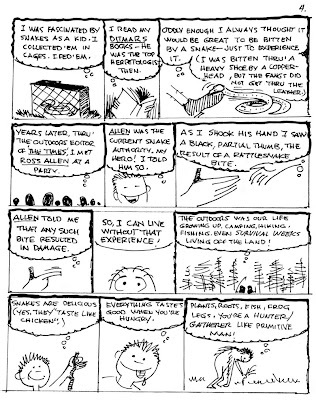 A complete 'forgotten' strip by Gil Fox. I want a reprint book of this material. Talk to Fantagraphics. huge amount of originals by Fox sold by Heritage after his death last year. Those Heritage originals showed he worked as a fill in artist for another panel... called Side Glances. Also from the same period, I have a charming little sunday strip about a beat cop. All in a different style. I find sometimes you have to submit twice before Blogger accepts your identity. Free software = Buggy software. I imagine Lowery only got the originals that Maurer didn't have to return to his stable of cartoonists. Maybe Fox was one of those who wanted his originals returned, and then later he tossed them. I didn't keep close track of the Lowery auctions, but I think you'll see a lot of material from Sponsored that those guys didn't get. If you kept track, and you can get Blogger to accept your ID, I'd really like it if you could comment on that aspect of each one when I post it. And Fox wasn't exactly a fill-in on Side Glances, he did it for 24 years. The reason I am not getting through seems to have to to with the difference between a blogger account and google account. Anyway - you didn't comment on the beat cop thing. You know that one or should I send scans? Amongst its other offerings, the Howard Lowery Gallery has been selling a lot of original comic strip art over the past year or so that bears a copyright to Sponsored Comics. Much of the work is top-notch and many collectors are wondering what Sponsored Comics was and where the strips appeared. When the art started appearing on eBay I asked the Howard Lowery people about the mystery and they claimed that they really didn't know anything about it. With nothing else to go on except the art itself, that left me worrying that I have a gaping hole in my Stripper's Guide listings. Sure, Sponsored Comics might have just been a project that didn't go anywhere, but if those strips ended up appearing in some newspaper somewhere I wanted to know about it. A lot of time passed with no leads appearing, but finally I found some evidence that clears up most, if not all, of the Sponsored Comics mystery. It turns out that the Sponsored Comics material did actually appear in print. It ran in a newspaper-style weekly tabloid supplement called Family Comics. It consisted of 16 pages -- 11 pages of color Sunday-style comic strips, four pages of black and white recipe and homemaker articles, and an ad page on the back cover. The 'magazine' was on newsprint and priced at 5 cents. The magazine was marketed to food store chains, mainly in California. I can vouch for two chains that used it - Shopping Bag Food Stores and Hughes Markets. It may have been marketed to other businesses as well, but for that I have no evidence. The food stores got their name in the masthead, ads on the back cover plus sometimes an additional ad inside. The marketing gimmick was obviously to get kids to beg their moms to shop at that grocery store chain every week so that junior could keep up with the funnies. To that end, the strips were tipped in favor of continuing adventures. That leaves the question of who was responsible for putting together these magazines. Here I have to go off into conjecture, but I am pretty sure that the man with the plan had to be Norman Maurer. Family Comics listed their address as Beverly Hills California, and we know that Maurer was based there. He contributed a strip to each issue, so we know he was involved at some level, and from what I've read of this fellow over the years, he was constantly coming up with marketing gimmicks of this type. You can read more about Maurer here on Wikipedia. The first issue of Family Comics was dated the week of May 4-10 1959, and the latest issue I have is #10, dated July 6-12. If there are later issues we could probably determine it easily enough from original art as most of the strips were coded with the issuing week. For instance, on the strips in issue #10 each has the code 7/6-12 lettered on it. So now that the mystery is pretty much solved, time for some fun. In the coming days I'll be featuring samples of the strips that ran in Family Comics on the blog. Be here tomorrow for the first in the series. Interesting post. Can't wait to see some scans. Folks, this is my 500th Stripper's Guide blog post. 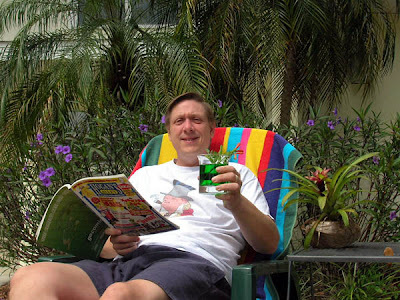 I've earned a a day off for rest and relaxation! Back tomorrow with the beginning of an exciting new series exploring the output of that mysterious syndicate, Sponsored Comics. I have a Gantz page - suposedly the last We 3 page. But it's the Maurer pages that interest me the most.